iPhone 5s battery connector repair service, have you attempted to change the battery inside your iPhone 5s and damaged the push fit battery connector on the iPhone 5s logic board if so this is the repair service for you, our in house service will remove the damaged battery connector and replace with a brand new battery connector allowing the battery to be correctly plugged into the iPhone 5s logic board again. * Our normal repair turnaround times are 3 - 10 working days. We always aim to complete repairs as fast as possible. 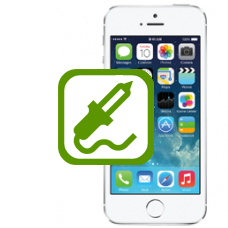 This is an in-house Apple iPhone 5s repair service, when ordering this service you are required to ship your iPhone into our repair centre for works to be undertaken.